The No. 21 USC women’s lacrosse team defeated Hofstra University 15-10 Saturday afternoon in its season opener at McAlister Field. The Women of Troy scored 10 goals in the second half to put the Pride away. Hofstra kept the game tight in the first half, controlling the draw 7-3. After halftime, the Trojans exploded offensively, scoring 8 out of the first 9 goals, including 3 straight goals in 60 seconds. USC dominated the draw after the break, winning 75 percent of them. Head coach Lindsey Munday said she was happy with the team’s second-half adjustments. Leading the way for Hofstra were junior midfielder Alyssa Parrella and sophomore attacker Katie Whelan. Whelan led the team in points with 5 from 4 goals and an assist. Parrella added 4 goals for the Pride, but she also had four costly turnovers. Hofstra freshman keeper Jess Smith saw a lot of action, facing 26 shots on goal and managing to save 11. 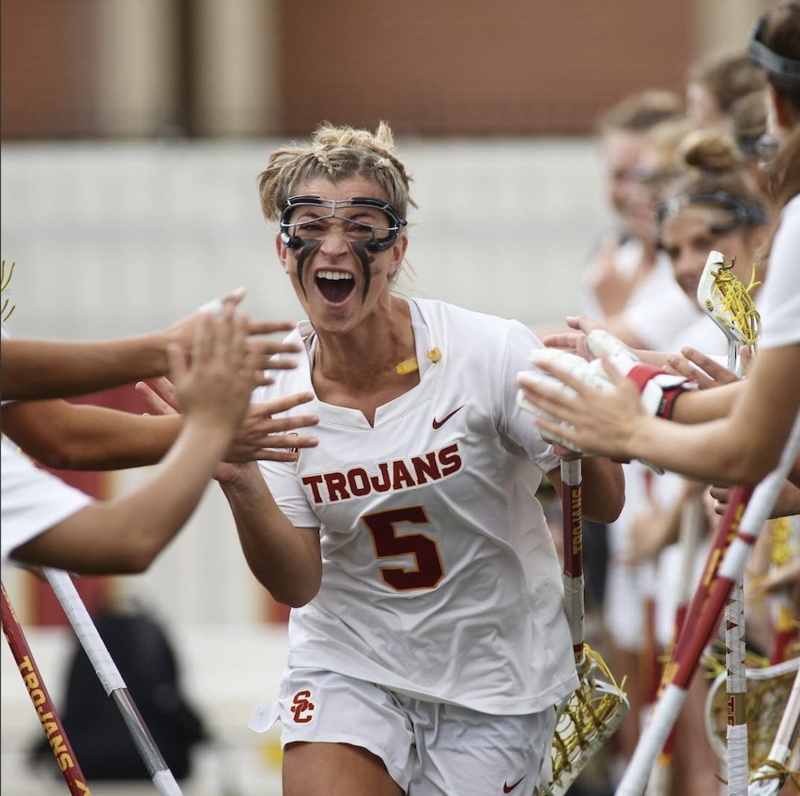 Eight different Trojans scored in the game, with freshman midfielder Katie Ramsay leading the team in scoring with 3 goals on three shots along with an assist and four draw controls, an impressive debut for the player ranked No. 47 by Inside Lacrosse Women. ILWomen No. 2-ranked freshman midfielder Erin Bakes also impressed in her first collegiate game, scoring 2 goals on three shots. The Trojan attack had a nice distribution, as each of the starting attackers scored 2 goals. Junior attacker and team captain Izzy McMahon controlled the offense, slowing down the pace when the team needed to settle after a long defensive possession. Senior attacker Emily Concialdi also pitched in with 2 goals and an assist. The Trojan defense played cohesively, forcing the Pride into four shot clock violations. Senior captain and draw specialist Jackie Gilbert led the unit with three ground balls. Gilbert said she is excited to lead this particular bunch of players. Sophomore goalie Riley Hertford stepped up for the defense, saving nearly half of the shots she faced in goal. Last year, only the top 13 goalies in the nation achieved that benchmark. Having joined the team as the ILWomen No. 13-ranked freshman in 2018, Gilbert’s immediate success isn’t surprising. “Riley really stepped up, especially in the second half, and really made some huge saves that were momentum turners,” Munday said. Next, the Trojans play San Diego State on the road Feb. 22 at 1 p.m. The post Women’s lacrosse season opens with home victory appeared first on Daily Trojan.